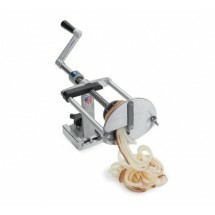 A French fry cutter is an important addition to any commercial kitchen that offers French fry style restaurant sides. Your kitchen staff will no longer have to worry about cutting up mounds and mound of potatoes in addition to all their other food prep tasks, since a French fry cutter will significantly reduce French fry prep time. 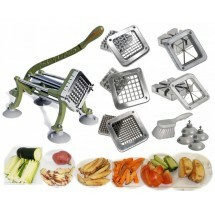 Some fry cutters can also be used to cut other vegetables for dips and salads. Although a French fry cutter is not a mandatory piece of kitchen equipment for every venue, for many it can be extremely helpful. Below we compare some of the different French fry cutters available on the market. 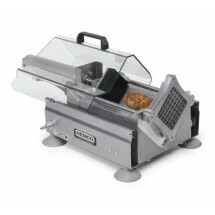 cuts 720 potatoes per hour! Best Use Basic, easy to set up. Use to cut mounds of potatoes into restaurant style French fries Can chop various hard vegetables into uniform matchsticks easily and quickly Creating garnishes and unusual fries that will set a French fry side dish apart from others Perfect for restaurants or catering operations, this fry cutter can produce large amounts of French fries and other sliced up vegetables for salads and other side dishes. 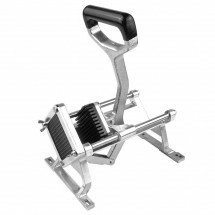 Comments This is the best budget-friendly French fry cutter option for venues that need to prepare small to medium quantities of fries in minutes Great French fries cutter for venues that need to prepare a lot of standard French fry side dishes on a daily basis.. This French fry cutter can create exciting additions to a restaurant menu. Chefs will love the possibilities that this fry cutter will present for food presentation, while French fry lovers will love the uniquely-shaped fries that can be prepared with this manual fry cutter. Businesses wondering how to provide enough French fries for a large event should look no further than the Nemco Monster Airmatic FryKutter. By investing in this piece of kitchen equipment, venues will be able to produce the required amount of French fries with little hassle.